Picnik.com makes manipulating and distributing photos a real picnic--even for the uninitiated. Everyone who's ever wanted to tap into their inner graphic artist can become a photo editing pro with picnik.com, which lets users grab photos from anywhere and easily edit and share them for a fraction of the price of programs like Photoshop. Now boasting about 13 million unique monthly visitors, Picnik garners about 20 percent of its revenue from advertisers and nearly 80 percent from its Picnik Premium subscriptions. Limited features are available on the site for free, but the full experience runs $24.95 per year, $19.95 for six months or $4.95 for one month. "It's what I would call the classic 'freemium' model," says Jonathan Sposato, CEO and co-founder. "You give away enough of the product for free to drive out innovation and value to the marketplace, then people don't mind paying for some really great advanced features." Picnik has capitalized on the efficiency of the web to help undercut traditional desktop software competition. As a cloud-based application, Picnik doesn't need to be downloaded--it's instantly available from any browser, which lowers operating costs. "The Internet will tell you very quickly whether your product is good or bad," Sposato says. "If it's good, people will respond with mouse clicks and by pulling out their credit cards." To help spread the word, Picnik offers official badges that are easily copied and pasted onto blogs, social network profiles, websites or "wherever else you want to add some Picniky goodness." Picnik also garners lots of coverage in the blogosphere, which draws new subscribers. 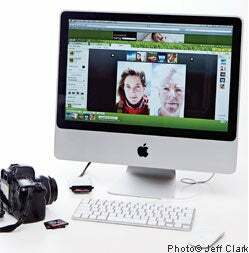 Users can grab photos directly from their computer or from websites such as Flickr, Facebook, Photobucket and MySpace and quickly edit, enhance, share and print them from any browser. Picnik Premium subscribers can upload 100 photos at one time, create digital collages and artfully layer photos stored in their Picnik Basket. Complete with a Twitter feed, the blog increases visitor loyalty and gives users a sense of community, Sposato says. Everything from company and staffer news to new features on the site and Featured Picnikers is covered. Users can grab an image directly from any website with the Bookmarklet, capture a screen shot with the Internet Explorer or Firefox Extension tool, and upload a photo directly to Picnik via the draggable-and-droppable Yahoo! Widget.